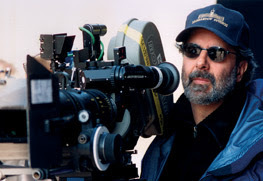 Director/Producer Jon Avnet (C'71) will serve as 1 of 3 judges for the new Mark Burnett/Steven Spielberg moviemaking competition series On the Lot. He will serve as a judge for the series' two "audition" episodes airing Tuesday, May 22 9/8c and Thursday, May 24 9:30/8:30c on FOX. Judges for additional rounds will be announced at a later date. Jon will be joined by actress, author and screenwriter Carrie Fisher ("Star Wars," "Postcards From The Edge"), as well as directors/producers Brett Ratner ("Rush Hour 3," "X-Men 3: The Last Stand") and Garry Marshall ("Georgia Rule," "Princess Diaries," "Pretty Woman"). ...This also is a big week for Jon, as his TV series he has executive produced, The Starter Wife, starring Deborah Messing, debuts this Thursday, May 24. Click here for a Gazette articles written about Jon. Click here for a DP article written about Jon. I've been a bit behind, but I've been watching the show online and Jon is featured in Episode 2. You can watch the show online here.